11:14 pm: The naked paraplegic was found and returned safely to the floor. Third year of medical school is the greatest test in a doctor’s life, a year of rotating throughout specialties, teams, hospitals, and lives. It leaves an indelible mark on every physician, but the story is often untold…until now. 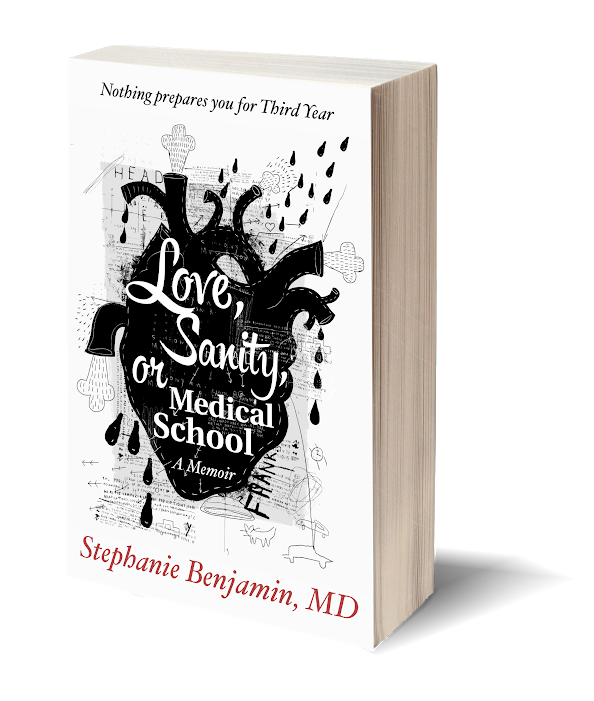 Told through gonzo-style, bare-it-all journaling, Love, Sanity, or Medical School takes you on a tour of Third Year with Dr. Stephanie Benjamin, a 9/11 and Katrina-surviving, former Junior Olympic fencer with a tenacious spirit and keen humor. Follow Dr. Benjamin as she navigates Imposter Syndrome and white coat snack-stashing, life-changing mentors and unbearable teammates, courageous cancer patients and booger-ridden pediatric patients, breakups, makeups, parties, research, exams, rounds, and learning what it’s really going to take to devote yourself so completely to the practice of medicine and patients. Love, Sanity, or Medical School finds its power in vulnerability, in documenting love, loss, triumph, failure, fear, and joy. You’ll never forget this slice of life from the white coat crowd.